The first thing I remember when I reach California is that it is really the golden state. The nature of the sunlight, the rolling hills, the glow off the surf -- it is all golden! Washington feels so different -- more blue/green. Lush! I was reminded of stepping off the plane in Honolulu -- it was the warmth of California with the addition of flowery aromas. I was in California to help celebrate the life of a close friend, Roger Wood. But, I had been planning a trip for a long time to see a variety of relatives and close friends with declining health. I flew into Orange County because I've loved that airport ever since Dani and Charles lived there. 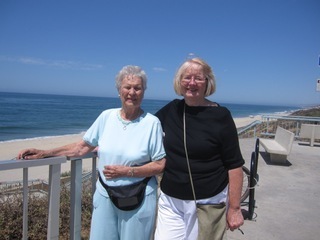 It is a) close to one of my favorite restaurants (Gulf Stream), b) close to some favorite haunts such as Rogers Gardens, Balboa Island, Sherman Gardens, the bookstore at Newport Library, c) the proximity to the toll road that takes me to Carlsbad in less than 45 minutes. I met some of the Rea's at the restaurant before heading south to Don's sister's house for four days. Pat isn't up to coming to Bellingham any longer, so I haven't seen her for a few years. It was great to catch up, see nephews and nieces, go to high tea with Pat and my nephew's wife, and meet up with some other friends for a few meals. The weather was typical Carlsbad weather -- glorious and breezy. 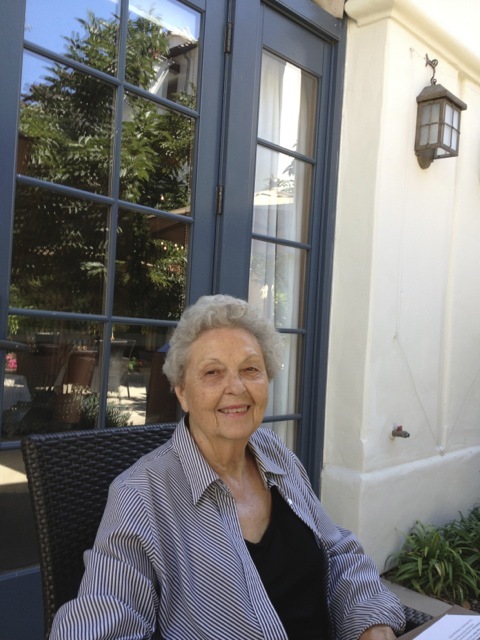 The visit was only marred by my constant updates from home about my friend, Etta, who was declining daily. Next stop, my sister's house in Santa Monica after visiting my 86 year old cousin, Dixie, in Long Beach. Linda and I enjoyed a day with all our cousins on my mom's side -- people we grew up with as our parents were close. 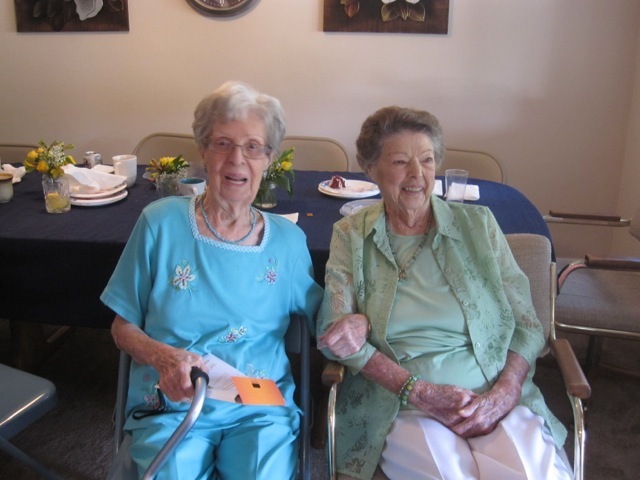 Karen had invited everyone to her house including my 99 year old aunt, Eleanor. Eleanor had recently attended a Dodger game, and went into the dugout to meet all of her heroes. She also got invited back next year to throw out the first pitch of the season for her 100th birthday! 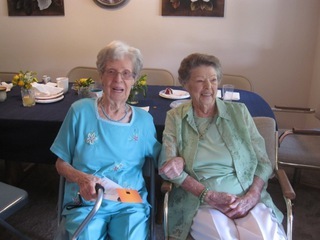 A real treat was bringing together Eleanor and our former neighbor, Margie, who is 98. They hadn't seen each other for probably 50 years. 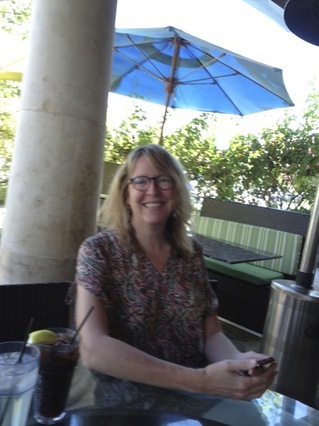 From Santa Monica, I went to Woodland Hills and had lunch with three good friends. I was taking some of Don's stoles back to Mary Becker, the artist who made them in response to particular sermons he had preached. Dani joined me the next morning and we headed north. 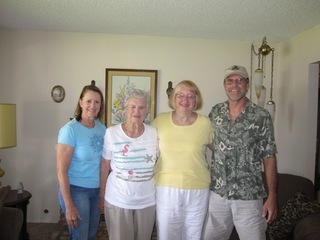 We had lunch with the Seidman's in Ventura. Both Don and their daughter, Cathy, have been very ill. It was wonderful to see Don, Millie and Nancy and share a delicious lunch. Then on to Ojai where we stayed with Kay and Marty Babayco and got to see their son and new daughter-in-law -- both recent graduates from Princeton Theological seminary. 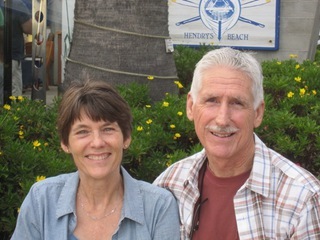 In Santa Barbara, I stayed with Judy and Lance Boyd while Dani stayed with her friends and former neighbors from Irvine. The four days were filled with Roger's memorial service which was beautiful and time spent at their family home. It was a really interesting experience to spend time with old friends, their children who are also old friends, and a whole slew of grandchildren who are now adults and are perfect strangers. It was also nice to spend some time with an old friend, Margo, and greet some former parishioners and friends at the service. It was hot, hot, hot! Everywhere but Santa Barbara was prepared for heat with air conditioning. Santa Barbara doesn't have many hot days. In fact, when we moved there we bought a dryer since you didn't have enough warmth during the day to air dry clothes. The fog didn't lift until noon and settled in again in the afternoon. The church for Roger's service was in the high 90's and I was conducting the choir -- not very comfortable for this WA resident. But, we persevered. It was a lovely trip. 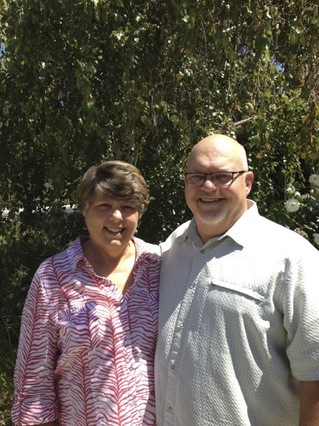 When Don and I arrived in Santa Barbara, the search committee of La Mesa Church said it was too bad for him to begin his career in a place he would probably leave. They were right. It is such a beautiful place -- and I could go back there in a heartbeat if I could afford the kind of home I would like to live in. Dani and I were fantasizing about it! But, it was also wonderful to come back to this gorgeous country. I was sad to miss the lovely month of August in the Northwest. We came back to dreary weather, but fortunately yesterday and today have been beautiful. I guess there are many beautiful places that one can live -- and friends who exist wherever you are. 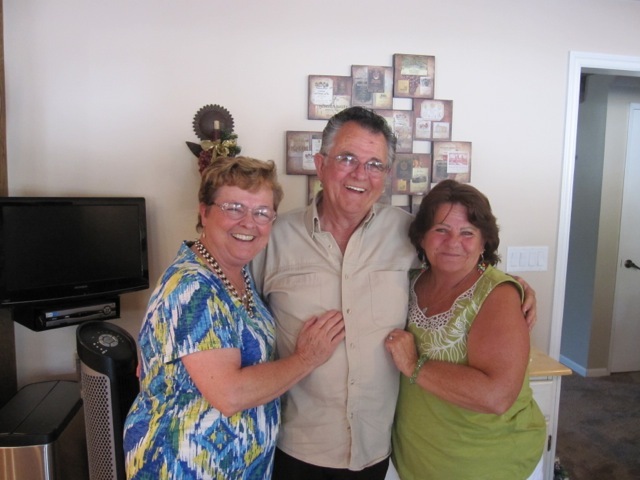 I loved spending time with old friends and family where you can bridge the gap of years within a heartbeat. But, it is nice to come home again wherever your home may be. 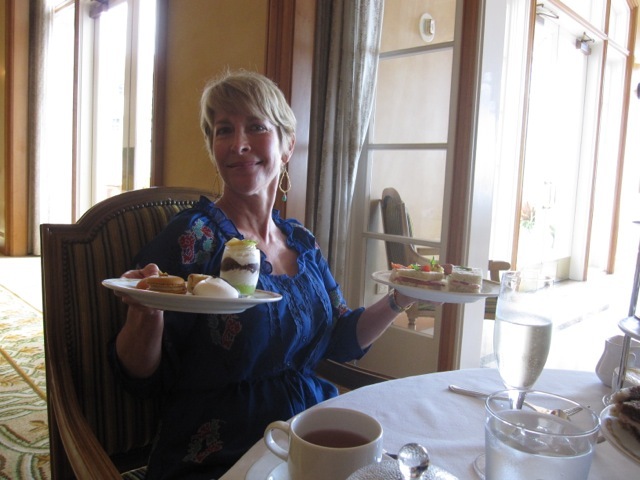 Tea with Kathy - showing off her Gluten free food! I've Lost the Month of August! What happened to August? It was characterized by my absence from home and deep sadness because I lost a couple of close friends -- one who died after a lingering illness and one who died rather suddenly. I hate being away in August, but I scheduled a long trip around Roger's memorial service so that I could visit relatives and friends in California. I began my trip flying into Orange County, dropped down to Carlsbad, then north to Santa Monica, Woodland Hills, Ventura & Ojai, and finally Santa Barbara. I planned to blog along the way, but I was so busy either visiting or grieving over the loss of my friend, Etta, who had suffered an aneurism just before I left and declined in my first week away, that I was not up to being chatty online. I will still write something about my California trip in another blog. I came back home after sadly missing Etta's memorial service, stayed for just enough time to get reoriented, and drove to the Shakespeare Festival in Ashland, Oregon, with three friends to see a round of plays and dine in our favorite restaurants. We saw The Tenth Muse, Cymbeline (Shakespeare), The Heart of Robin Hood, King Lear (Shakespeare), The Liquid Plain, and My Fair Lady. I arrived home Sunday evening missing our church's farewell sendoff for our pastor, Kent, as he is returning to Boston. I had church meetings yesterday, and today I began my year as supervisor for City University counseling interns. So, I feel as though I lost a whole month in Bellingham -- a month where no one wants to leave Bellingham because of the lovely weather. California was hot. Oregon was hot. Today I am freezing! I began the day with a long hour drive to Concrete Elementary School to meet my new intern. It was simply gorgeous with the mountains looming over the valley and puffs of fog lingering between the mountain tops. The forests of trees are beginning to change to their fall colors and it is a beautiful and peaceful drive. I look forward to the two or three trips each quarter to observe my intern use her counseling skills. I met the counselor of the school who is her mentor and found that I know her mother well as she was a principal in Bellingham. She warned me to be careful driving on the roads to Concrete because herds of Elk roam the hills and often cross the highway without warning causing total damage to cars. She suggested that if I saw even one elk to slow down and expect there to be many more lurking behind. Yikes! And, here I was taking in all the glory of the morning and probably paying little attention to the road! I have one more intern to meet this week and the quarter is under way. I don't feel like doing much at home except sort of getting my life back in some kind of groove. But, the losses of the summer linger and I am not really ready to give up the summer I missed in Bellingham. I'll have to remember that fall has always been my favorite season. This fall brings James as a senior in high school and Allie moving into a dorm just down the road. Nico has started first grade. Nicole is a junior and little Lionel has moved into his new home just a block away from their old apartment. Life changes all around me.